The My Little Pony Blue Collector Art Pony (sold separately) is the first art pony, specially designed for collectors! If you like this one, be sure to add this unique horse to your collection as well. Click through for pricing and availability. Designed by artist Junko Mizuno! Known for combining the macabre with the adorable, it only makes sense that Hasbro would team up with the great Junko Mizuno! Her drawings combine freakish monsters with adorable people, coated in bright colors with a dash of "awww." 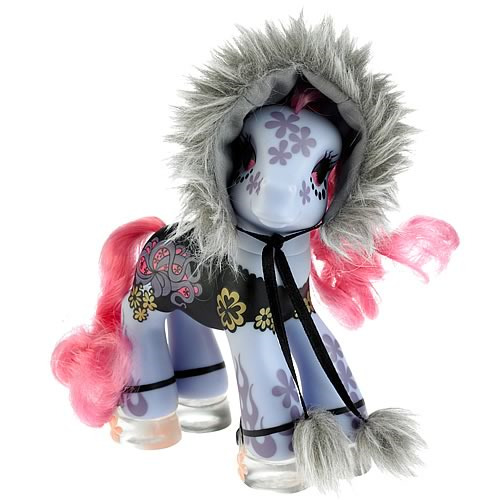 This sensibility translates well to this new pony, featuring a fuzzy hood, flowers, tentacles, flames, pink eyes, and pink hair. While she might look good in a toy box, she'll look even better on your desk or on a shelf. If you've ever wanted to impress your friends with an arty creation from a member of pop art royalty, now is your chance!